Each InSinkErator comes with a red square overload protector. This 1-minute video uses simple animation to show how to reset the disposal's overload protector. Your InSinkErator disposal is equipped with a device called an overload protector or reset button. This device will turn the disposal off automatically if there is something wrong. If the disposal is jammed, if it is run for a very long period of time, or if there is another issue, it will shut down automatically. 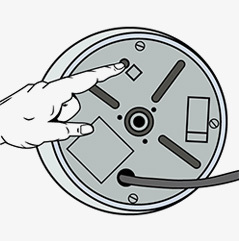 Before following the below steps, first make sure that the disposal's switch is in the off position. The overload protector is located under the sink, on the bottom of the disposal, facing the floor. The overload protector is located under the sink, on the bottom of the disposal, facing the floor. It is a red square button. If the overload protector is tripped, you will see the red button dropped down about a quarter of an inch (5mm). Gently press the red button. If it does not stay up, wait ten minutes and try again. If the red button will not stay in, or the disposal requires repeatedly resetting the overload protector, the disposal may need service. If the problem with your disposal is due to defects in materials or workmanship, InSinkErator ma​y pay to have an authorized service center service the disposal in your home at no charge to you.